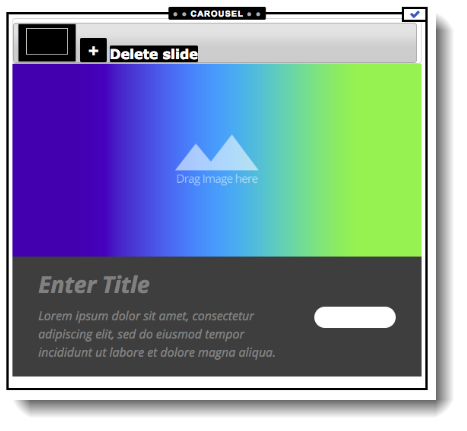 The Carousel allows you to insert a slideshow into your site. 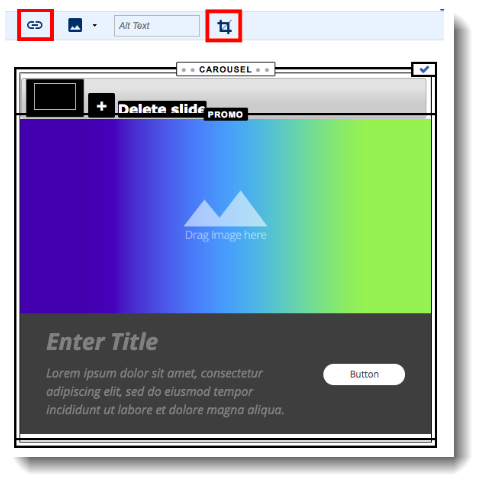 The options in the Carousel tab provide different formats for your slideshow. You can change the format as desired after adding the Carousel. 1. Log in to your School Loop account and access the Modules. 2. At the module selection screen, choose the Carousel tab and then select one of the available formats. 3. A Carousel will be inserted into the selected location. The format and size of your selected Carousel may vary from the image below. A) Drag and drop to upload images. B) Arrange the slide order by dragging the image thumbnails into the desired order. C) Add a new slide. D) Delete the selected slide. Toolbar: Use the highlighted tools to set the Carousel's aspect ratio (size), slide transition, the duration between slides, and add navigation (arrows and/or dots). Edit the text on the banner or tissue, if available for your selected format. Use the Link icon on the toolbar to make the slide a link to a destination of your choice. Use the Crop icon to position the image inside the slide frame. You may drag and drop multiple images at once to quickly add multiple images to your Carousel. The text blocks in the banner, including the button, are optional.